Pastitsio is a Greek pasta bake made with spiced lamb mince, tomato sauce, bechamel sauce and layers of macaroni. As lovely as it sounds, I reckon the constituent ingredients could be made even better by giving them a Scottish twist. 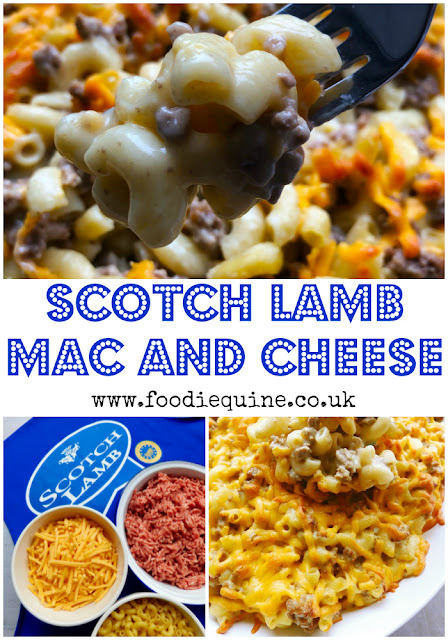 How about Scotch Lamb stirred through creamy macaroni cheese before being topped with lashings of Scottish cheddar and baked in the oven until ooey and gooey? Doesn't that just scream out midweek comfort food to you? The best bits of macaroni cheese and shepherd’s pie all rolled into one. What's not to like? The blue 'Scotch Lamb' label is what I always look out for when choosing my lamb. 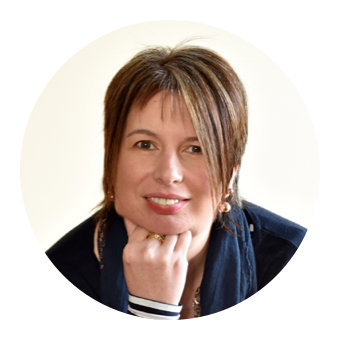 Whilst many people tend to associate eating lamb with springtime, for Scotch Lamb the best time of year is the autumn when it's at its peak of seasonality. The Scotch Lamb label has European PGI status which ensures quality, safety and taste. 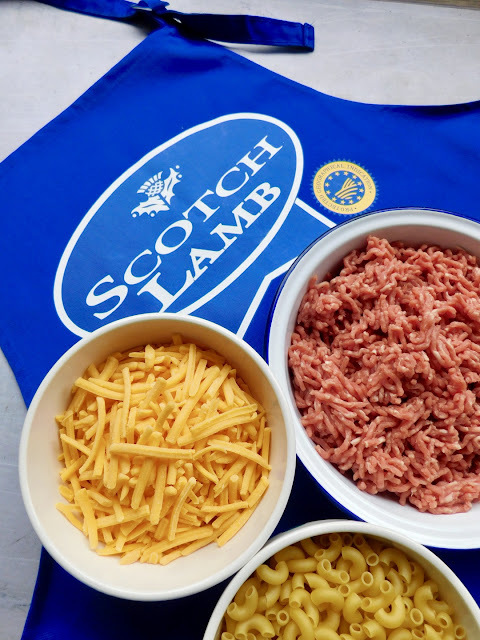 The label also guarantees traceability of the meat from farm to fork and only selected Scottish farms which meet stringent criteria regarding welfare, feeds and natural production methods produce Scotch Lamb. Lamb is also naturally rich in protein, low in sodium and provides seven vitamins and minerals that contribute towards good health and wellbeing, including zinc, potassium and vitamin B12. For me lamb is a natural choice for a midweek meal, particularly in minced format as its so versatile. A quick look back through my recipe archives finds it in Haggis Shepherds Pie with Scotch Lamb, Lamb Keema Nachos, Greek Lamb Shepherds Pie with Feta Mash and Yiouvetsi (One Pot Greek Lamb with Orzo) Absolutely no need to be stuck in a midweek mealtime rut with a pack of Scotch Lamb in your fridge or freezer. In our house we have Pasta Bake Mondays. Due to a multitude of activities it's one night of the week when no one is around at the same time to eat together. Dancing, Jog Scotland, Air Cadets, Duke of Edinburgh's Award and Rock Choir mean that everyone eats on the run, by themselves and at different points of the evening. Pretty much par for the course in a busy family. I can get a pasta bake like my Scotch Lamb Mac and Cheese made during the day, then pop it in the oven ready for the first person to serve themselves up a portion. Later incumbents can give it a blast in the microwave and any leftovers become lunch the following day. You will need three separate pans on the go for the three elements of this dish but don't let this put you off, it's still very much a fuss free midweek meal that will be enjoyed by the whole family. If you are going to be baking and serving immediately, set the oven to 180c degrees, otherwise you'll just need the hob for now and the oven when you come to reheat the dish. Put the Scotch Lamb Mince in a pan and stir gently until broken up and browned. Add the finely chopped onion and fry until softened. Bring to the boil then turn down the heat and simmer gently for 20 minutes. Cook the macaroni in boiling salted water according to the packet instructions, drain and set aside. Put the milk in a saucepan, add the flour, butter and seasonings and bring everything gradually up to simmering point over a medium heat. Whisk continuously with a balloon whisk until the sauce has thickened and becomes smooth and glossy. Add the grated Scottish Cheddar and whisk until melted, taste and adjust seasoning if necessary. Combine together the mince, macaroni and cheese sauce and tip into a a large ovenproof dish. Top with the remaining 100g of Scottish Cheddar Cheese. If cooking immediately, bake for 25-30 minutes or until golden brown and bubbling. If cooking from chilled it will require 45-50 minutes. Disclosure: This is a commissioned post for Quality Meat Scotland. As always, all views expressed are my own. Oooh yes I love this, a Scottish version of Pastitsio! It looks so unctuous and the lamb makes it even heartier, perfect for autumn winter. This looks incredibly delicious. I know my whole family would like this. This is perfect comfort food for the oncoming cold months and short days. Mac n Cheese is one of the best and additions have to be a good thing. This looks so deliciously creamy! Perfect comfort food. This is comfort food indeed!! Love everything about it!